Originally posted at Gypsy ReviewsI haven’t had many experiences with steampunk and the ones I have had were unpleasant and I didn’t enjoy the books very much. I found steampunk ridden with too many details that were unrelated or benefical to the story. 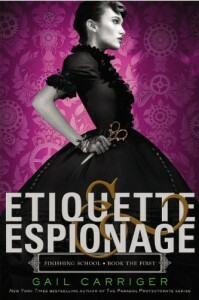 Etiquette & Espionage however proved to be quite the opposite and proved me wrong with its quick humour and fantastic world building.I am a huge fan of Victorian England, it’s probably only second to my love of the Tudors and I love that steampunk is integrated into Victorian Society. Gail Carriger’s world is rich and filled with so many possibilities and she ties in some paranormal elements as well with vampires and werewolves. Carriger is clearly familiar and competent writing out a convincing steampunk novel, making the elements of the mechanics seem believable and although it was hard to understand them because sometimes the details were overwhelming and hard to put together because I’m not familiar with machinery, it all seemed to make sense. The concept of having a Finishing School is really one of the things that makes this book pop out. The girls at the Finishing School are not just learning etiquette but they’re also learning how to be spies, use weapons, recognise poisons and so on. There’s even a boy’s school for evil geniuses! Sometimes heroes do get a little overrated, it’s fun to see how things are from the other side.Sophronia was such an enjoyable heroine! She was spunky, quick-witted, sharp, had a great sense of humour and adventurous. This is how you want your heroines to be like, to know who they are and embrace that but also acknowledge the areas where they should improve on, not change. Etiquette & Espionage also had a myriad of interesting characters with very peculiar names, I loved the way the names just rolled off your tongue with the different syllables you wouldn’t usually put together for names. The characters were all very intriguing and I was sad that we didn’t get to see some of them enough, a lot of questions weren’t answered actually but seeing as this is a series and those kind of adventure books, we might see more of them in the various future adventures. Also YAY FOR NO MAIN ROMANCE! Some minor crushes were definitely mentioned but nothing big happened and that really ties into the story well because considering that it was Victorian England, you wouldn’t expect relationships to happen so quickly unless they were being courted, engaged, married and so on.The story was unique, I liked it although it could have definitely been improved in terms of the timeline because I did find the ending wrapped up too fast. I was expecting a bit of a surprise or twist but there wasn’t, albeit disappointing but it’s okay. If there was a surprise or twist, it might have been too complicated in this case. I did feel that Carriger was writing for a more younger audience, around Middle Grade, rather than YA though, I don’t have any objections to that though considering how the mechanics of steampunk might have been hard to understand to a MG audience.Etiquette & Espionage features a rich and peculiar world of steampunk set in Victorian England, teaming with endless possibilities that will set your imagination going and going. You will be enchanted by the world Gail Carriger created no doubt! A wide myriad of characters and a fantastic premise that calls for much potential in the sequel, will be very interested to see what kind of adventures Sophronia gets into next!